Feeling blue? Can’t think straight? Tied down with endless piles of paperwork? Life getting you down? Add a spring to your step with the latest all-natural nootropic supplement; Genius Joy. 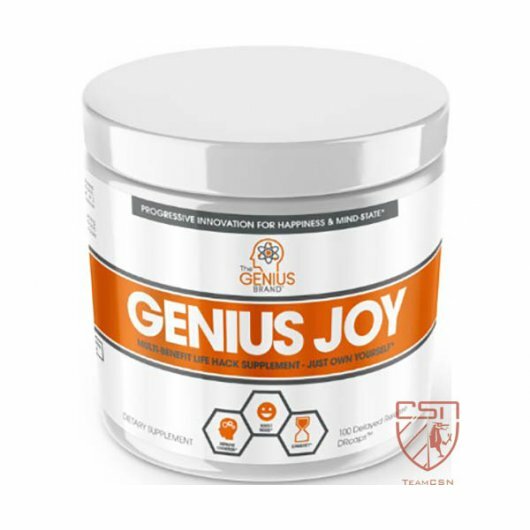 Launched in 2017, Genius Joy is the latest nootropic supplement from The Genius Brand helping you “Bring joy back into your life”. Genius Joy is a “Progressive Innovation for Happiness & Mind-State”. This is a fancy way of saying it helps release serotonin and dopamine — the two primary brain chemical which play important cognitive roles in mood and motivation. Genius Joy claims that all the below ingredients give the proposed benefits. 5HTP - Boosts serotonin levels, which can improve mood and reduce depression, insomnia headaches and obesity. They have used HTPurity which is a supreme trademarked version of 5HTP. N-Acetyl-L-Tyrosine (NALT) & Rhodiola5Plus- Another group of ingredients that have shown to reduce mental and physical stress. S-Adenosylmethionine Tosylate Disulfate (SAMe) - Supports well-being and mood, promotes healthy brain function and may help lessen symptoms of anxiety, depression & PMS. TheaKalm - Can help improve focus and stabilise mood by increasing L-Theanine. Red Panax ginseng - It's been said this can improve thinking, concentration and memory. Why choose The Genius Brand? This natural nootropic is backed by the Genius Promise - no unnecessary fillers, no dyes, no artificial flavours and no artificial sweeteners. This means the product is a pure, clean sports supplement. It is a clinically dosed supplement with no proprietary blend, formulated to serve a true purpose. Genius Joy selects high-quality ingredient formats, some of which are premium, well-researched brands, and supplies them at adequate dosages. Professionals, athletes, gamers and everybody in-between can benefit from this serotonin booster. Cardiff Sports Nutrition sees Genius Joy as a valuable supplement for anyone whose productivity may benefit from a neurotransmitter-enhanced mood boost.